"Seize the moment and see this picture"
Pixar has done it yet again. Another masterpiece is upon us and the result is as mesmerizing and moving as anything the creative minds at the studio has gifted to the world. It deserves a spot among the best films of this year. Centered around Dia de Los Muertos (Day of the Dead), where every year families recognize their deceased loved ones who come to visit, the film manages to bring something fresh to the table with seeming ease. You may think you've already seen this film in the form of another film that deals with the Day of the Dead. If that keeps you away from this film, that would be unfortunate because this offering is quite different from what you might think. 12-year old Miguel (Anthony Gonzalez) comes from a big family of shoemakers. The logical step in his life path would be to follow suit and go into the family business. Yet, Miguel has the heart of a musician. Making shoes couldn't be further away from his dreams. In a family that outright forbids music in all its forms, in the name of protection, Miguel isn't allotted the space to express himself in the way he feels he needs to. Wrapped up in being like his hero, Ernesto de la Cruz (Benjamin Bratt), suave and seductive singer/musician/actor from a golden age ala Elvis Presley, Miguel finds himself living by the code of seizing the moment. When a talent show in Miguel's village presents itself, he is determined to show everyone that he can do more than make shoes. Soon he unexpectedly ends up in the Land of the Dead. Miguel will have to use his wits as well as rely on some new friends in order to avoid being stuck there. [caption id="attachment_101721" align="aligncenter" width="640"] What's not to enjoy about this film? The acting is fantastic, especially from young Gonzalez in the role of Miguel; the visuals are almost unremarkably great, which is to say that you almost take for granted the beauty in the visuals because Pixar has spoiled us so and the music is quite affecting. The film is also super sensitive to the culture depicted in the best way possible. It is refreshing to see a film like this that respects culture as opposed to presenting culture through a stereotypical lens. It also doesn't hurt to have actors of Latin background populating the proceedings. For a film that is essentially about such a tough and weighty subject as death, there is a good helping of levity to be found. Unsurprising in a family picture for sure, but perhaps what is surprising is how the levity comes in. For instance, a joke tossed in about someone choking on food on its own isn't very funny. It could be viewed as being in bad taste, but a group of dead people teasing another dead person about a silly way that person died, is relatable and opens the proceedings up for laughter. The film also gets dark at times displaying very real, very human emotions and behaviors, which adds a great deal of richness. Along those lines, it would have been nice if there were more bits of backstory added in for one of the films most interesting characters, de la Cruz. Who was his family? Who did he come to visit from the other side, if at all? What shaped his belief that the world was his family? What was he like in life outside of his stardom? What kind of person was he? What made him make certain decisions? Why was he so driven to "seize the moment"? For everything Coco does well, the film fails to give us more beyond a single moment of human weakness. We don't see any of the childhood trauma or turmoil that could have affected de la Cruz, nor is any of that suggested, Alternatively, we don't see any of the positive aspects of his background. The only outright dig to Coco is the (rather long) short that preceded it, Olaf's Frozen Adventure. 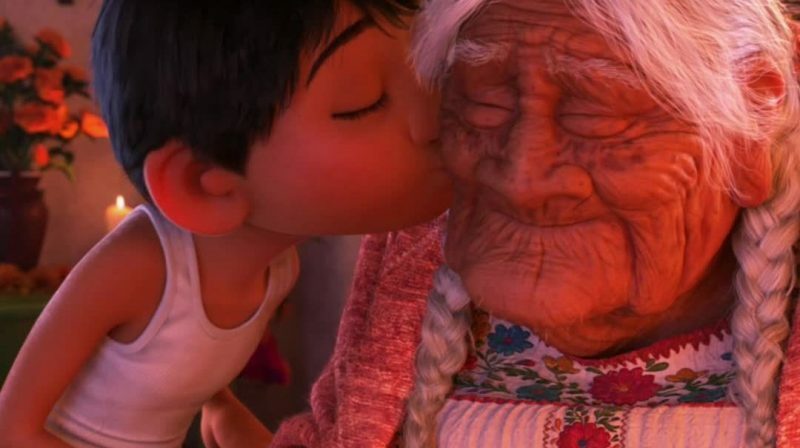 While it is a beautifully animated film like the parent picture it is spun from, it tonally or culturally doesn't feel as appropriate a lead into Coco. It is understandable that in order to possibly lure white audiences to a film about Mexican characters and culture, you would add a lily-white short. However, take another culturally sensitive animated film like Moana and think back to the short that preceded that, Inner Workings. It was an original piece that dealt with the inner workings and thoughts of the body and spirit. That short didn't feel nearly as tonally out of touch (or as long) as Olaf's Frozen Adventure does for Coco. It's a strong case to revisit the world and characters of Frozen, but it might have been best to keep it a separate affair. Coco is amazing though. Not enough backstory on Ernesto de la Cruz; too much about the myth and not enough about the man in life.